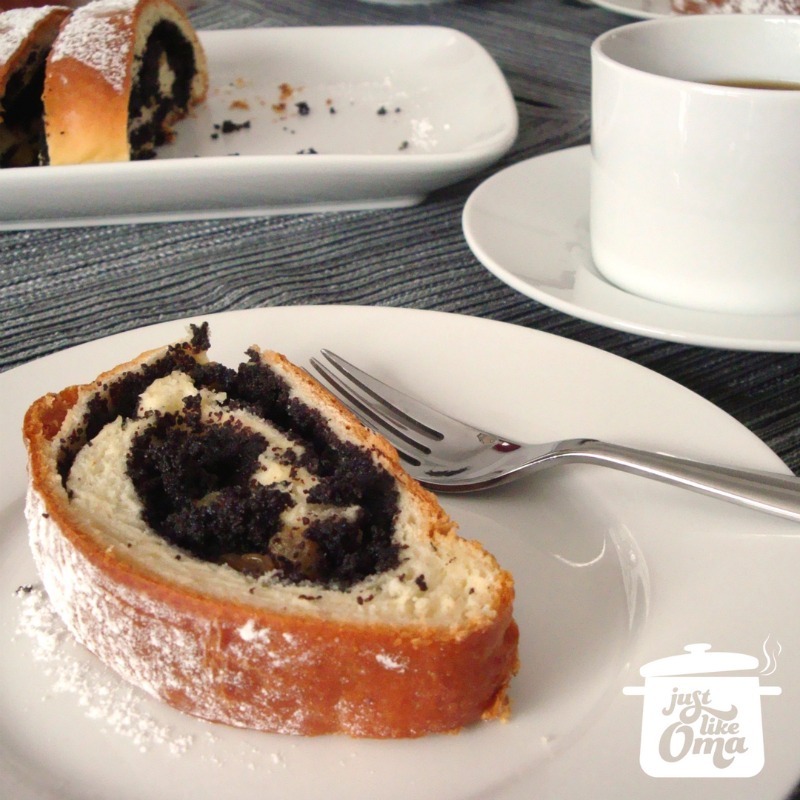 My poppy seed roll, aka Mohnkuchenrolle, is so easy to make. Use your bread machine to whip up the dough. (No bread machine? Click here for the instructions and then follow the recipe below. Then, prepare the filling, roll it all together, and bake! Let cool slightly and eat fresh! WUNDERBAR! Yes, that easy! Bread machine, Oma? Yes!!!! 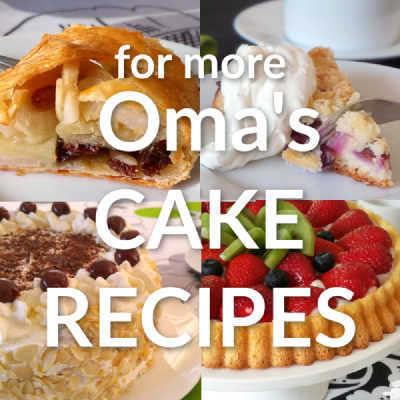 Oma loves easy German food recipes! And this is one easy poppy seed cake recipe! You see, yeast recipes don't have to be complicated. Put all the yeast dough ingredients in the Bread Machine pan. Use the "dough" setting and start. This usually takes about 1½ hours. In the meantime, if you are using raisins, put them into a small bowl and sprinkle with rum. Prepare your cookie sheet by greasing it with butter. Make the poppy seed filling by mixing together the poppy seeds, sugar, butter, lemon juice, lemon zest, and flour in a small saucepan. Add milk and stir. Bring to simmer and simmer for about ½ hour until thickened, stirring occasionally. Let cool before using. When the dough cycle is finished, remove the dough. Put a bit of flour on the counter and knead the dough slightly. Divide the dough in half. Roll out one half until it makes a rectangle about 10" X 10". Do this by patting the dough, pulling it, and then using a rolling pin. Keep lifting the dough from the counter to make sure it doesn't stick. Try to use as little extra flour as possible. Drain the raisins, and add them to the poppy seed filling. Spread half the poppyseed filling over the surface of the dough, keeping about 1-inch from the edges. Roll up, jelly-roll style. Place on cookie sheet. Repeat with other half of the dough. Cover rolls and let rise in a warm, draft-free place for about 30 minutes. Gently brush rolls with melted butter. Bake for about 30 - 35 minutes or until golden brown. Let cool on cookie sheet. Brush with additional melted butter and sprinkle with powdered sugar, if desired. Each roll cuts into about 8 thick slices. Here, my granddaughter, Lydia, helped me make this. So yummy for our afternoon kaffeeklatsch with the family. Put the filling down the middle third. Cut the sides and fold over as shown above. Place on baking sheet. Bake as in recipe above. Drizzle with a lemon icing. (Mix powdered sugar with a bit of lemon juice). Does yeast dough scare you? Give it a try! I know the recipe looks long and complicated, but it really isn't. While it is resting, make your filling and let it cool down. Put the filling on it. This would be great to be included in your holiday baking recipes. Like all yeast cakes, this one does taste better fresh. So plan to use it the same day. However, since the filling is a bit moist, it will help keep the cake moist for a day or so. 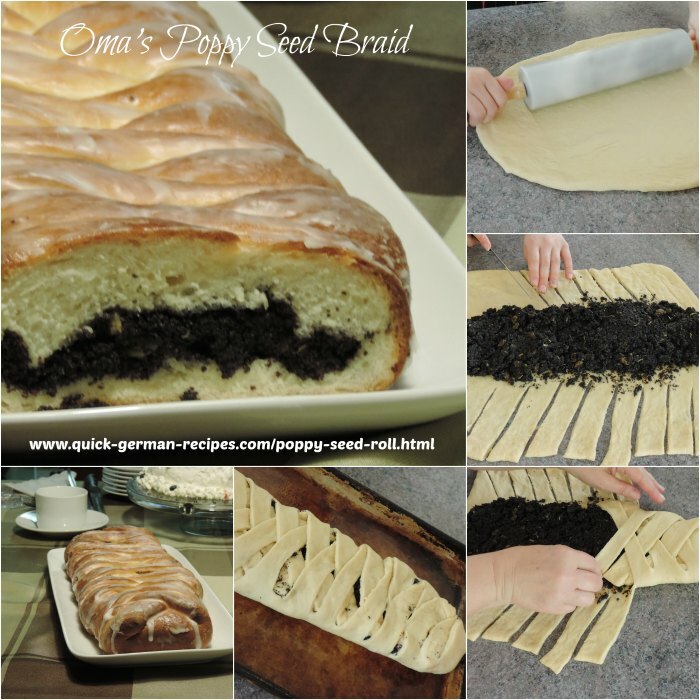 Oma's poppy seed roll is so easy to make. Use your bread machine to whip up the dough, mix the filling, roll it all together, bake, and ENJOY! Yes, that easy!